Several woodhenges have been found in the central part of the United States, including the Cahokia Woodhenge and Mound 72 Woodhenges (both located at the Cahokia site in western Illinois) and Moorehead Circle and one at the Stubbs Earthwork near Fort Ancient, both in the US state of Ohio. These have also been interpreted to serve ritual purposes, probably having to do with the control of calendrical information. 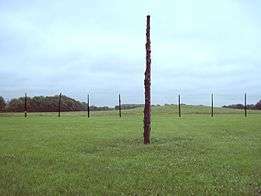 The Cahokia Woodhenge was rebuilt at least five times in its history, each successive iteration being of slightly different diameter and with a different number of posts. Each episode is numbered from Woodhenge I to Woodhenge V. Woodhenge III was 410 feet (120 m) in diameter and contained 48 posts. A reproduction of the Woodhenge III was constructed in 1985, with the posts being placed in the original post pit holes discovered by archaeologists. The Mound 72 Woodhenge was located several thousand feet to the southeast of Woodhenge III. It was 412 feet (126 m) and also had 48 posts, but unlike the other woodhenge at Cahokia, it only underwent one construction episode. A series of elite burials, mass sacrificial burials, and two small platform mounds were constructed over the circle, one at the summer solstice sunrise position and the other at the winter solstice sunset. At a later date the posts were removed and the summer sunrise mound was enlarged and turned into a ridgetop mound, now known by archaeologists as Mound 72. The Moorehead Circle was discovered in 2005 during magnetic surveys of the Fort Ancient site, a large hilltop enclosure near Lebanon, Ohio. The woodhenge is three concentric circles, with the outer circle having an estimated 200 posts and being approximately 60 metres (200 ft) in diameter. 1 2 Young, Biloine; Fowler, Melvin L. (2000). Cahokia: The Great Native American Metropolis. Urbana, Illinois: University of Illinois at Urbana-Champaign. ISBN 0-252-06821-1. ↑ Miller, Gregory L. (2010). Ohio Hopewell Ceremonial Bladelet Use at the Moorehead Circle, Fort Ancient (Masters) (Thesis). Ohio State University.